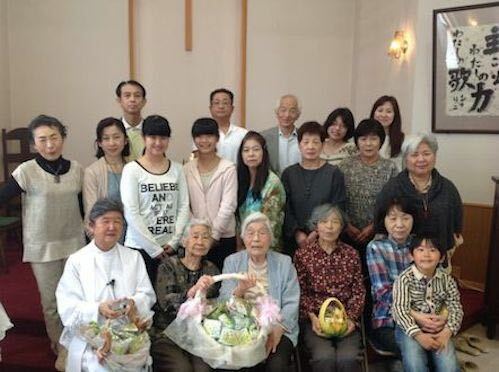 Although Easter Sunday was on April 20th this year, our main celebration in Miyazaki was on the 27th, as Rev. Yoshioka was in Nobeoka on Easter Sunday. Yuriko Abe entertained us on the piano after lunch, then quite a few of us visited Mariko Sakamoto at the nursing home where she now lives, for home communion. The photo was taken at the church just after the main service. Easter will be late this year - Easter Sunday is April 20th, at least in the Gregorian calendar. Since Lent starts 40 days (excluding Sundays) before Easter, that means that Lent is also starting late this year. Today is Ash Wednesday, the first day of Lent, traditionally a time of repentance and preparation for Holy Week and Easter, often marked by some (usually only symbolic) fasting. Today is Easter Sunday. Holy Trinity Church, Miyazaki, like many other churches around the world, had a special service this morning. This was followed by a brief general meeting to approve the painting of the roof, and a special party for lunch.